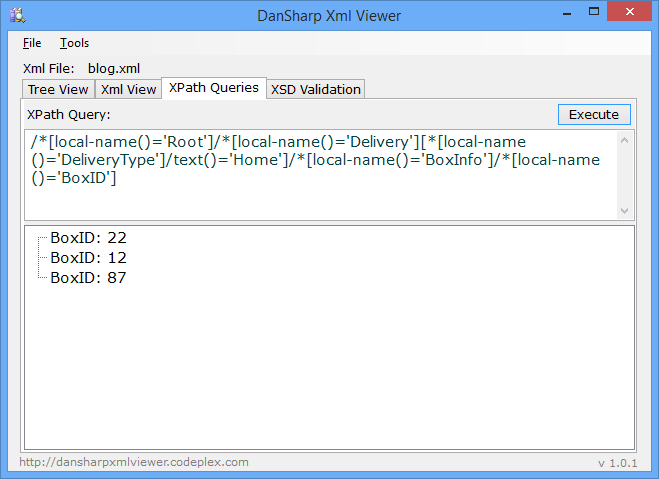 In my search for the correct xpath, a colleague told me about DanSharp Xml Viewer, which is a great tool for testing xpaths for BizTalk. The tool let’s you load a schema, and then you can create xpath queries by selecting the nodes. You can also test your own queries, so you know right away what your queries are doing, and make changes quickly. Really a tool that really helps when writing xpath. This will retrieve the BoxID’s of home deliveries, which we can then iterate through in our orchestration. This entry was posted in BizTalk, XSLT / XPATH by Eldert Grootenboer. Bookmark the permalink.